I stood in line for cabbage this morning. Yes, cabbage. I was number 1 in line. I waited for almost 10 minutes for them to find one lousy box of cabbage and bring it out. And for some strange reason they slice off the a piece of the stem before it's put out so I had to wait for that to be done too. I waited cabbage after I had to ask for beets and then waited over five minutes for them to appear. The guy brought two bunches, holding them up for inspection like rabbits fresh from the hunt. I took the bunch with the biggest beets and the longest leaves. I was kept company by two women. One was wearing head-to-toe Sons of Anarchy Illinois gear and was talking very loudly into her headset about the lack of cabbage. She didn't buy anything else. I bet there is 50 Shades next to her bed. Another woman, who was very tall and had on a very bright flowery top, was snatching up everything that was leafy and green. The size and leafiness of our cabbage choices matched our physical sizes. We went from small to medium to large and leafy. Both of them eyes my beets very curiously. I didn't offer an explanation. I went to Jewel this morning. I needed borsch ingredients and several cleaning supplies and if I would've gone to my regular stores it would have been three stops instead of one and I didn't feel like driving around all morning. Plus I didn't have my morning tea yet. I thought I was so clever, going to Jewel. My list wasn't even that big: beets, cabbage, beef, coffee, fennel, rosemary, and Windex wipes. I got into three cart traffic jams with other customers (at some point I heard someone yell "Hey, look out! Women shoppers! "), had to stand on my toes to reach the Windex wipes, couldn't find any suitable coffee (the T-discs must be in the same isle as crème fraîche) got coffee creamer only to discover upon return home that I already own the exact same creamer and it has not been even opened yet, and filled my cart with freshly baked chocolate cookies which were not on the list of course. All this before I arrived to the produce department. If I would have started at the produce I would have run like hell and went to the other three stores I usually shop at. There was no produce in produce. Something ate everything: either a swarm of locusts or everyone decided to juice while watching the Bears yesterday. They were in the process of restocking, but it was going very slowly because it took two people to decide that the compressor hidden under the trays of salad was malfunctioning. There was a lot of staring at the compressor involved while holding trays of peppers, which meant that none of us were getting the peppers at that moment. I was the brave one that interrupted that little conference not once but twice, first for beets, second for cabbage. I was very polite and even gave them a smile. As I rolled toward checkout I commented to myself that even in Russia no one stands in line for cabbage anymore. iPhones – yes, cabbage – no. Silly me, I brought my reusable bags with me (once again, in the wrong store). The packing guy looked like he knew what to do with them, until the cashier told him not to put bananas on the bottom of the bag and he had to start all over. My brain was now replaying a scene from Innerspace where the checkout girl crushed a gallon jug of apple juice on top of a carton of eggs while chewing gum with her mouth open. My carton of eggs went in sideways. I rolled out a cart full of shopping bags, but on the way to the car I realized that the two that I brought were half-empty and I had four extra plastic bags containing my stuff. I had to repack everything in the parking lot. Sure enough, all my purchases – including the overly-leafy beets, the super tiny head of cabbage, and the weirdly-shaped fennel – fit into the two bags that I supplied. When I got home I discovered that one of my eggs was cracked on the bottom. Maybe the guy needed some gum to chew. I still need to make a coffee run tomorrow. Unless I can ply my borsch-making visitor with a cappuccino instead. That I have plenty of. How to avoid Halloween and fail miserably. "Mom, I think on Friday after school we should decorate for Halloween!" Danny said with a smile and hid behind the couch. "Perhaps we should wait, it's still September," I replied. He popped back up, looked at my unexcited face, rolled his eyes, and then slowly fell backward on the carpet in a dramatic display of desperation. A Method actor, all the way. I waited. "Possibly, if you do your homework and practice piano first." I was trying to postpone Halloween decorating for as long as possible. "Ok... But can me and Daddy go to that Halloween store next to Trader Joe's so Daddy can see it?" meaning: so I can check it all out and buy a splattered witch I want and you don't have to take me because I know you hate it. "Ok!" and he happily ran off. I started to hope that perhaps he would forget his decorating plan come Friday, but deep down I knew it was an exercise in futility. Danny does not forget anything when it comes to something he wants. And he wants a Halloween-decorated house. I don't like Halloween. I hate the black and orange color combination, I hate all the horror movies that fill the channels for the entire month of October, I hate the tasteless and obnoxious Party City costume commercials, I hate the odd chemical smells emanating from the so-called decor isles in stores, I hate the mountain of candy that's involved. Until recently, I successfully managed to avoid Halloween for years thanks to spending the evening in the company of Serbian friends that were celebrating a completely different holiday on the same day. That celebration involved cases of wine, table full of food, and a clear home "brew" that disinfected you from the inside out on the intake. I even managed to be Halloween-free while Danny was little. I didn't buy him a costume or went trick-or-treating and avoided the whole topic in general. But then grandparents took over and supplied costumes and a trick-or-treating experience. I voiced my resistance but failed. Danny was getting into it. And then he went to school. They do parades and parties and everyone dresses up. He had to wear a costume to school and parade in one long loop for all the parents to see and capture the entire event with their paparazzi length camera lenses. One year, he paraded outside in the cold in just his flimsy Superman shirt and no coat. The next year I ordered him a costume of his choice (spider) that was made out of fleece and stuffed with batting in case there is another outdoor parade. It even came with a hat which was of course too small for his head, but he put it on anyway. Thank God he decided to wear the same thing this year, a small victory for me because I didn't have to buy another costume. Pottery Barn Kids doesn't vary their choices from year to year, the only other option he would go for is a shark, but after that I will have to talk him into being and art student (old jeans, dirty sweatshirt, and bags under eyes from sleeping much less than any other major). For a long time my decorations consisted of only a large ceramic pumpkin which was actually a soup tureen. I was extremely happy with my pumpkin, it was all the decor I needed. Then Master of the house unleashed his plan. "I wish we had some Halloween decorations," a little voice would say with a sigh passing through the kitchen. "Maybe we can get a pumpkin," I would reply after several rounds of deep sighing, just to make him stop. "Ok! And one more decoration!" He was doing math before he was doing math. I started looking for artful pumpkins that I could explain to myself as fall decor that would last me till Christmas, rather than Halloween decorations. The couple of times we got a live pumpkin and carved it I almost cut my hand, got sick to my stomach from all the squishy pumpkin guts, and the entire thing rotted in less than a week. The stinking moldy mess would end up in my garden as a hopeful fertilizer only to seed itself and overtake the entire space the next summer. The strawberry patch turned into a pumpkin patch and I had more orange balls than I could handle. And the one thing my backyard tenants would not eat is a pumpkin, they can't bite through it! What kind of rodent are you if you can't bite into a pumpkin? I've attempted several times to avoid a costume party only to fail yet again. Once I was invited to a "dress as your favorite witch" bridal shower. After stating that the only thing I'm willing to wear is my tiara, a friend suggested that I should be Glinda and even provided me with a sparkly pink gown that her daughter wore to prom. I was very sparkly and very princessy, but could not get my skirt through the front door. Any door opening for that matter. And it took me 10 minutes to get in and out of the car and I needed lots of help. I think the fact that I am much shorter than the original owner of the dress might have had something to do it – I bustled the front which created extra volume and a large train. And I almost set myself on fire when I attempted to ascend our hostess's front porch stairs that she creatively lined with burning tea lights. I ended up squeezing myself into the side kitchen entrance to avoid the flames. Danny got to see me in my costume and was very confused. The next day he told everyone that I was so big I couldn't fit through the door. I think a year after that Terry talked me into attending a Halloween party. He really built it up and we planned our couple costume. He went as Bob Ross (large curly hair including) and I was his Happy Cloud. Well, one can not buy a cloud costume. I had to make it. I roped another friend (thank God for wiling participants) into helping me and we spent the evening sawing clumps of pillow stuffing onto a white nightgown. We even made a rainbow headhand to top if off (which really looked like a rainbow tiara because let's face it: if I'm dressing up there better be a crown involved). The puffs started falling off as the night went on and when I got home I was a very deflated cloud. Danny scored a victory that year, he got to go to one of those pop-up Halloween stores with his dad in search of a curly hair wig. Also that year some very distinct Halloween items of orange and black color combination appeared in my house. I was slowly losing the battle. I attempted to lose some of those items after the "holiday" was over, but my packing was carefully supervised by Danny. I think he knew what I was up to. This year I pinned Halloween decor to my Holidays board. I even found a Martha Stewart craft that Danny and I could do. As I was pinning it, I told myself that it was really to use those dead branches that are all over my yard from the neighbor's dying tree. And while I was downloading the template I was telling myself that it was to finally use all that black paper I had under my bed that I ordered for a project years ago and never used. Today I spent almost an hour contemplating a ceramic spooky tree decoration while browsing at Home Goods. What I really should have gotten was that horse head that caught my eye. I even bought Halloween kitchen towels to include in my package for my Russian friends. The spooky tree is now sitting in our family room. It's hand painted. I have a new pillow in the living room that says "Boo". As I drove Danny home from school, he told me about the splattered witch that we could hang on our door because we don't have a wreath and witch's legs that one can stick into the ground. And I actually said yes to both. Last night I finally solved a 20 year old mystery. I finally found the title of the movie I was searching for all this time. One summer, when I was little I saw a movie. I must've liked it so much that some bits of it stuck in my memory. But I never remembered the title (not to mention it would have been useless anyway since it was a foreign film dubbed in Russian). Terry and I love talking film, we watch a lot of movies and can pretty much have a meaningful conversation comprised solely out of movie lines. One day I asked him about an old movie that was really funny and the only reference I gave him (the only part I remembered) was that it had a car that had cocaine in the tires and diamonds inside the battery. He didn't know, which totally surprised me. That was before the time when one could plug in random words into a browser and get a meaningful hit. At some point Terry brought me The Man with One Red Shoe, hoping it was what I was talking about. It wasn't. But it was funny and it did have a car with cocaine in the tires. The Man with One Red Shoe was added to our ever growing DVD collection and I kept on searching. Last night I mentioned it again. Dosing off, Terry suggested that perhaps it's the original French film that The Man with One Red Shoe was based on. I asked, what French film? He told me that if I go to Wikipedia, I should be able to track that down. I bolted out of bed and slowly crept into my office. There, in the dark, with my fish for company, I once again started my quest. First there was a Wiki search, which did not yield the right results. Then I tried Google, which was completely pointless. It gave me hits for tires, not a movie. By this point I remembered that there was also a large diamond in the steering wheel of the car in the movie. I decided that perhaps I should switch gears and give Bing a try. I typed in "caper movie with cocaine in tires, diamond in steering wheel." Bingo! Bing solved in the first hit. My mystery movie was Le Corniaud, a french film from 1965. I even found a YouTube trailer, and all of a sudden I remembered most of the movie. I ran to the bedroom to inform Terry. "I found it!" But he was out cold. I fell asleep smiling ear to ear, finally at peace. Now, how do I get my hands on the DVD? As I stood next to Danny, gently patting his head from time to time, I looked around. The sight of students lining up was familiar to me, almost nostalgic. But, there was something missing... And then it hit me – flowers. There were no flowers for the teachers on the first day of school. First day of school in Russia was celebrated with flowers. Every kid brought a bouquet of flowers for their teacher. Mostly gladiolas, I don't know why. I always brought something else instead, one of my parents (and we're still debating which one) was not a fan of gladiolus. 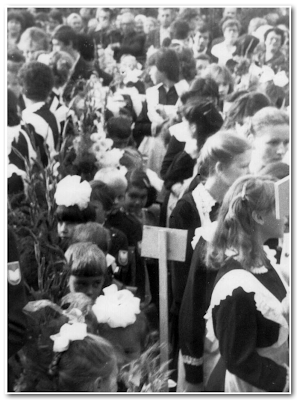 Teachers kept vases in classrooms to store the flowers, and at the end of the day carried the huge heaps home. Often they asked their spouse to come and help them carry the flowers, there were too many for just one person to manage. The flowers were a sign of celebration and appreciation of the teacher's work in the upcoming year. The sight of students lining up in front of school, everyone holding flowers, was a strange one. We had uniforms, designed by Lenin's wife, and basically looked like the maids from the Ritz about to go and clean the rooms. Boys wore blue "suits" with white shirt, and girls had a brown dress with white aprons. Everything was made out of polyester. (White aprons were for "special occasions", during normal school days we wore black aprons, which made us look like maids even more. )** It was the flowers that provided color, and some indication that this was an important day (and not a sign of apocalypse). And it was the sight of the sea of flowers that was missing from Danny's first day of school, and I found that strangely odd. It was so odd to me, and I was so bothered by the lack of flowers that I rushed to the store and got a nice bouquet for Danny's teacher. I gave it to her when I picked him up. She was surprised and flattered at the same time. Right then and there I decided that, from now on, I would uphold the Russian tradition of bringing teacher flowers on the first day of school. I might not end up liking the teacher toward the end of the year, but on the first day she'll get flowers. Might have to provide a small vase as well, because I doubt the teacher will be prepared for a bouquet. * Russian academic year starts September 1 and ends May 31. There are only 1-10 grades, there is no pre-K or K. The group of kids that are in your class in 1st grade is the same group that will be with you all the way through 10th. You become a close bunch and classes don't interact with one another. ** When communism fell, so did the uniforms. Students now wear regular clothes. Thank God!